Well, good morning to whoever reads this! It's been quite a while since I've posted anything. I wanna say since before last fall. Since my last post, I have started college which has been amazing!! My first semester was good and I'm in my second week of the second semester and its going great so far and I am absolutely loving the college experience. I am going full time this spring with 14 credits and with various other things I do, my plate is pretty full. I've only done one other mani aside from that one I'm showing today since I've started school. I lost alot of steam for any inspiration and motivation to do any mani's and I didn't want to force it so that I didn't dread doing then, you know? What I did for these was quite simple. I used Sally Hansen's French Kiss as my base and I wanted to do something else to them without being extravagant. 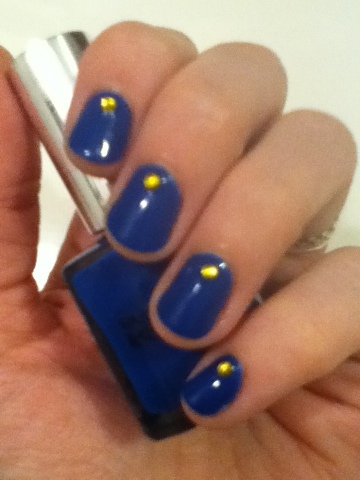 I had had some rhinestones that I'd never used and I had enough yellow ones for both hands, so that's what I did. 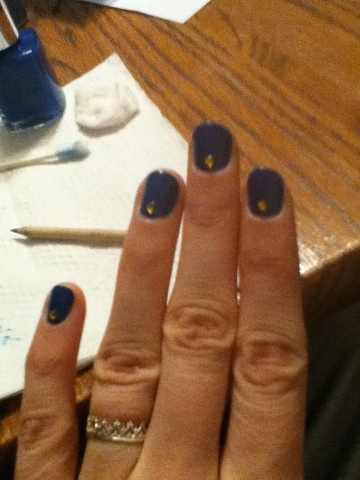 I love the navy blue and yellow combo. Adding some white would have been nice but I wanted to keep it really simple. Well, hope you all have a great day and weeks to come. Adios, Chickas!